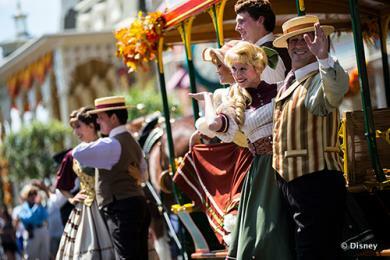 Join the Citizens of Main Street U.S.A. in a Fall Trolley Show at the Magic Kingdom. Starting today, September 1st guests can enjoy the finest fall seasonal songs as the Citizens celebrate the arrival of autumn. Pass through the gates at Magic Kingdom park, and the harvest celebration begins with this festive ode to one of our favorite times of year. This delightful taste of Limited Time Magic! And don't forget that for one day only, on Friday September 13th the Villains will take over at Disney's Hollywood Studios from 8:00 PM until 1:00 AM - also known as the 13th hour. It's sure to be a devilishly delicious affair, with a host of fiendish festivities. Because nothing says fall like September in Florida. Sorry folks, but we are still in the 90s here. Disney was about a month early on this one.